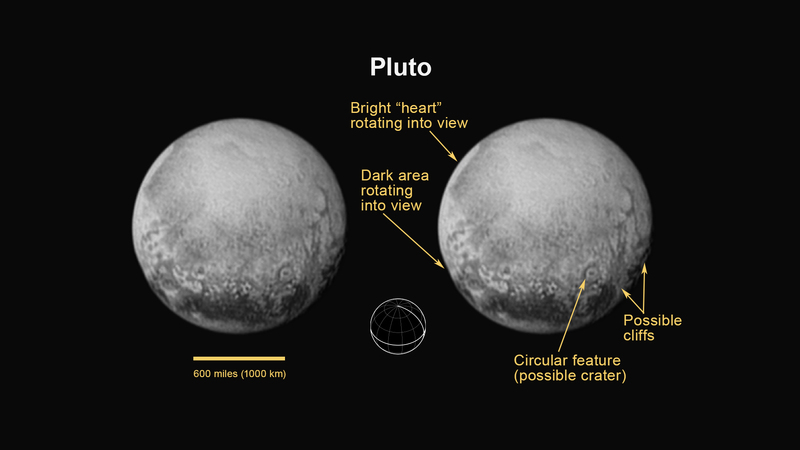 On July 11, 2015, New Horizons captured a world that is growing more fascinating by the day. For the first time on Pluto, this view reveals linear features that may be cliffs, as well as a circular feature that could be an impact crater. Rotating into view is the bright heart-shaped feature that will be seen in more detail during New Horizons' closest approach on July 14. The annotated version includes a diagram indicating Pluto's north pole, equator, and central meridian. As NASA's unmanned New Horizons spacecraft speeds closer to a historic July 14 Pluto flyby, it's continuing to multi-task, producing images of an icy world that's growing more fascinating and complex every day. On July 11, 2015, New Horizons captured this image, which suggests some new features that are of keen interest to the Geology, Geophysics and Imaging (GGI) team now assembled at the Johns Hopkins University Applied Physics Lab in Laurel, Maryland. For the first time on Pluto, this view reveals linear features that may be cliffs, as well as a circular feature that could be an impact crater. 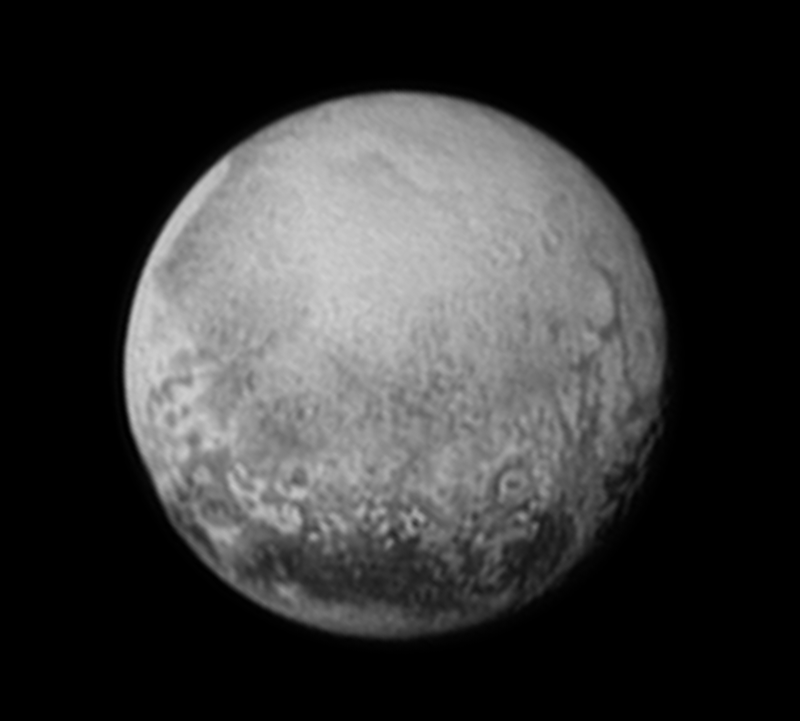 Just starting to rotate into view on the left side of the image is the bright heart-shaped feature that will be seen in more detail during New Horizons' closest approach. The New Horizons spacecraft is now approaching a milestone – only one million miles to Pluto – which will occur at 11:23 p.m. EDT tonight, Sunday, July 12. It's approaching Pluto after a more than nine-year, three-billion mile journey. At 7:49 AM EDT on Tuesday, July 14 the unmanned spacecraft will zip past Pluto at 30,800 miles per hour (49,600 kilometers per hour), with a suite of seven science instruments busily gathering data. The mission will complete the initial reconnaissance of the solar system with the first-ever look at the icy dwarf planet.